Raisin bread lovers are always on the lookout for new recipes. 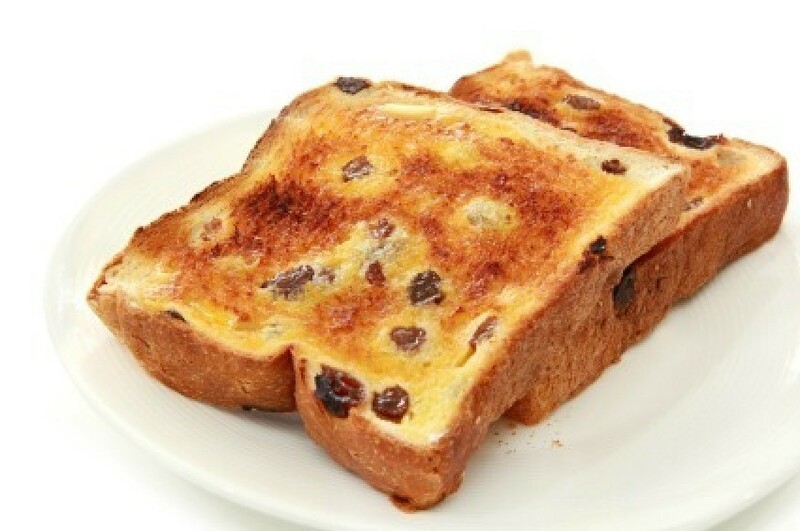 This page contains raisin bread recipes. This is my favourite raisin bread as it's super fluffy and chewy. I'm not really keen on the heavier ones that are spiked with cinnamon to have in the morning, so this is a nice alternative. It also makes an awesome sandwich bread. The raisins go amazingly well with meats and veggies! Put all ingredients, except raisins, in the bread machine pan in the order recommended by the machine's manufacturer. Run on soft bread or white bread cycle. Add the raisins 10 minutes before the kneading cycle ends. Spoon or pour flour into dry measuring cup. Level off and pour measured flour onto wax paper. Measure warm water into large warm bowl. Sprinkle or crumble in yeast; stir until dissolved. Add warm milk, sugar, salt and margarine. Stir in 2 cups flour. Beat with rotary beater until smooth (about 150 strokes). Stir in raisins. Add enough additional flour to make a soft dough. Turn out onto lightly floured board and knead until smooth and elastic, about 5-10 minutes. Cover with plastic wrap, then a towel. Let rest on board 20 minutes. Punch down, divide dough in half. With a rolling pin, roll each portion into an 8x12 rectangle. Beginning with upper 8 inch edge, roll dough towards you. Seal with thumbs or heel of hand after each complete turn. Seal final seam and edges well. Place in 2 greased 8x4 loaf pans. Brush with oil. Cover pans loosely with oiled wax paper, then top with plastic wrap. Refrigerate 2-24 hours. When ready to bake, remove loaves from refrigerator. Using a greased toothpick or metal skewer, puncture any surface bubbles which may have formed on the dough. Bake at 400 degrees F for 30-40 minutes, or until done. Brush tops with melted margarine, if desired. Makes 2 loaves. Mix sugar, eggs, and zucchini. Add other ingredients. Mix well in mixer. Pour into loaf pans, cake pans, or bundt pan. Put yeast and 1 tsp. sugar in warm water. Set aside. Mix boiling water and oatmeal. Let stand 2 minutes. Add 1/4 cup sugar, shortening, salt and molasses. Recipe for Molasses Raisin Bread. Combine milk, shortening and molasses in mixing bowl and let cool till lukewarm. Add yeast and then allow to stand for about 5 minutes. Recipe for Coffee Raisin Bread. Toss raisins with 1 Tbsp. flour; set aside. In a large bowl, pour coffee, egg and oil together. Dissolve yeast. Mix first mixture, yeast, salt, sugar, spices and 1 cup flour together. . . 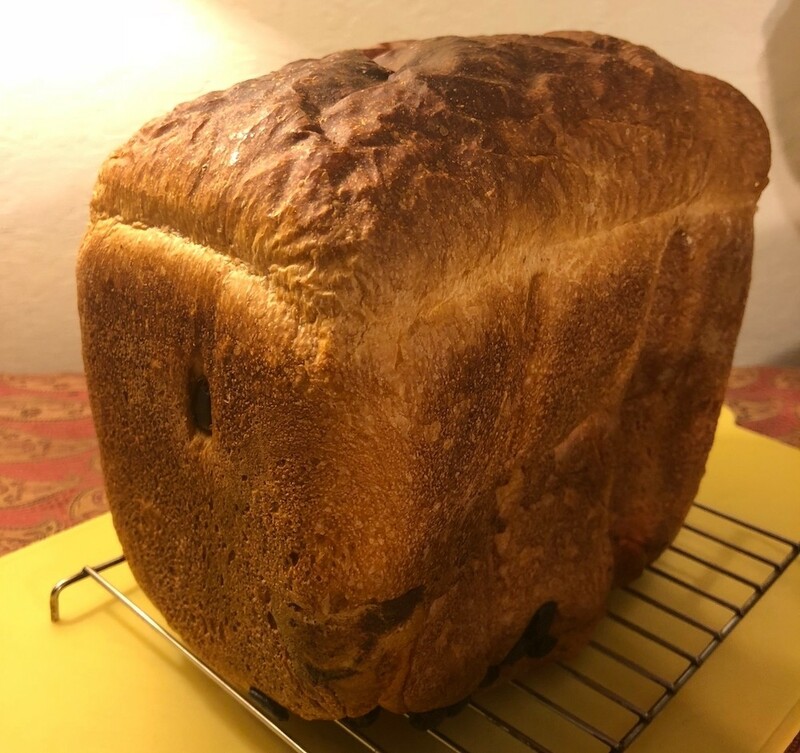 I am having a problem making raisin bread in my bread machine. It's an old Breadmaster machine and I have no instruction book. If I add the raisins at the beginning of the cycle they just disappear into the dough. When I wait until I hear the first "beeps" the raisins end up stuck to the bottom of the loaf. Does anyone know what I am doing wrong? Thanks for any advice. What's wrong with them disappearing into the dough? I usually add mine with the rest of the stuff because I get busy and forget to listen for the add beep and wind up with raisinless raisin bread. When I slice the bread they're there. I know what you mean; they disappear because they've been chopped up and incorporated during the kneading. The last set of beeps is supposed to be when you add them--at least it is on my (Welbilt) machine. 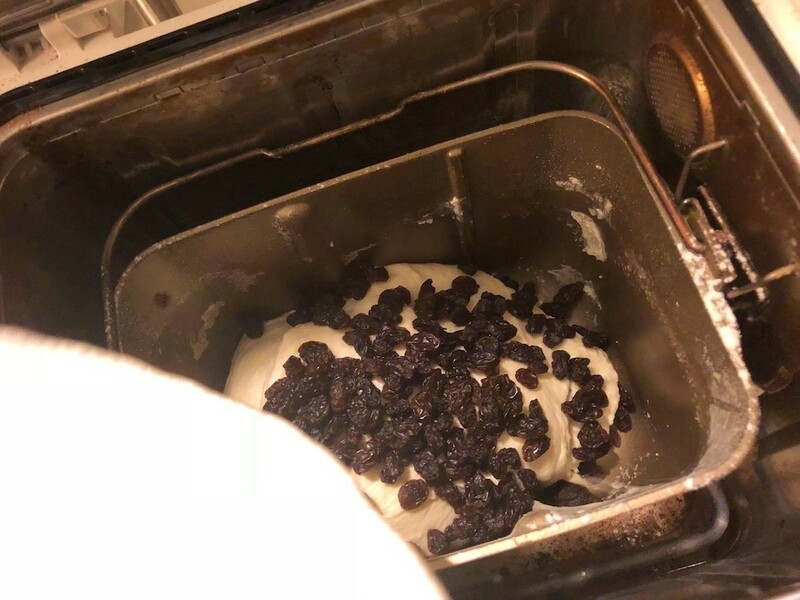 Your dough recipe may need a bit more liquid to make the dough soft enough for the raisins to be folded into it (as opposed to sticking to the bottom). I would try this first. You want the dough to be soft, but not sticky. Poke it while it is kneading, once all the ingredients are combined and it looks like dough. If it feels too firm, add liquid, let it knead and poke again. You can keep repeating this, until you get the dough nice and soft. Once you know how much extra liquid you need, you will not have to "babysit" the dough. 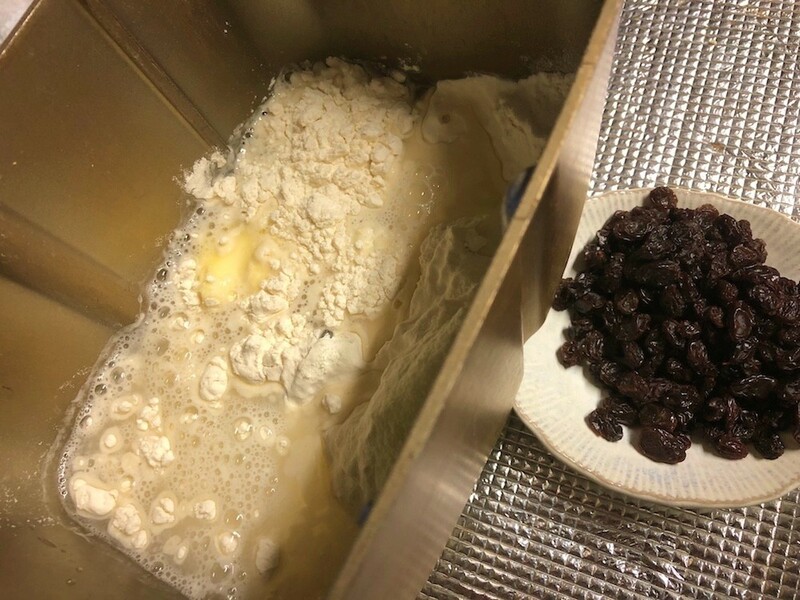 Try coating the raisins with flour before you put them in the dough. That's what is usually suggested when adding raisins to other breads and things, so they don't sink. 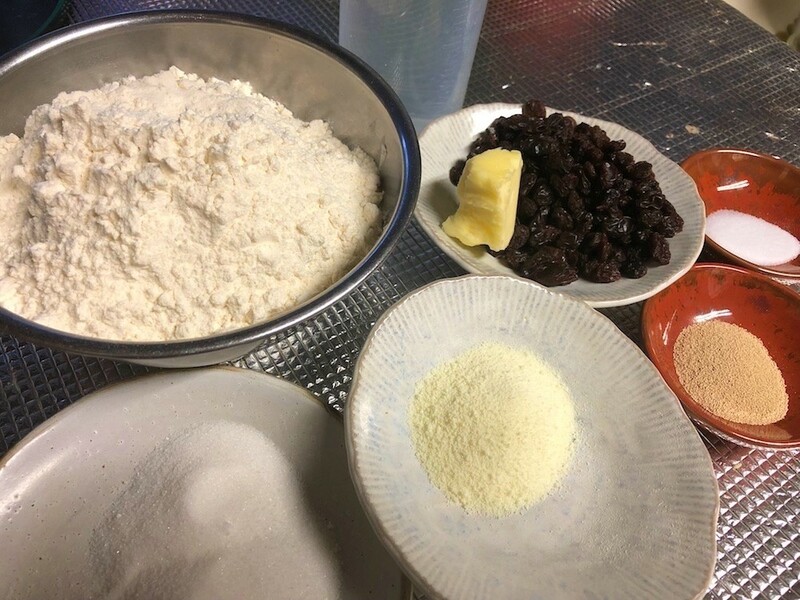 Throw some flour in a bowl with the raisins and stir to coat. Get rid of all the excess flour (use a strainer or something). 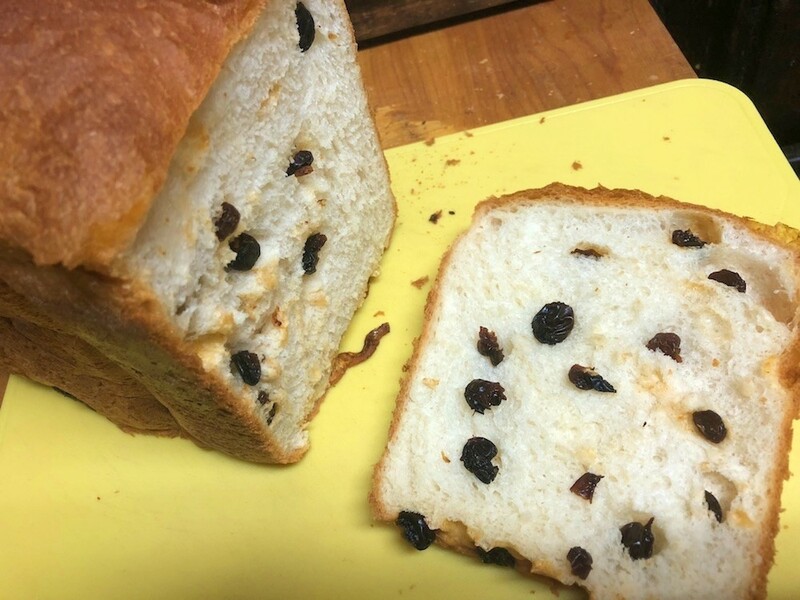 If you don't add too much flour with the raisins, it shouldn't effect the bread. i roll mine in a little sugar before i add them when it beeps. Coat your raisins with some extra flour before adding them to your bread dough. This may make then less likely to go to the bottom or stay top. You can roll them in flour towards the end and this should help them from dropping to the bottom. I always add extra raisins about half the amount stated but I start adding them bit by bit. I put in about half after the first raising cycle when the machine starts knocking the dough down and mixing and then the rest when the beep comes on. This usually works for me. I don't always cook my bread inside the machine because I prefer making the bread in loaf tins for a better shape so I do this in the stove and also I can make two smaller loaves and freeze one. So if I needed to add more raisins I could do so when shaping the bread. Go to http://safemanuals.com/ They have, hundreds, maybe even thousands, of instruction books and manual for lots of different products. They are listed by brand name. Put in your model number and you can download what you need for free. Good luck. I am looking for a copycat recipe for Sunkist Raisin bread preferably one that has raisin concentrate in it. I would also like information on how to find and/or make raisin concentrate. Thank you. To my knowledge raisin concentrate is just taking a couple handfulls of raisins and boiling them in minimum water for a few minutes. I do this to the raisins I use in my raisin pie recipe. Do like 1C raisins to 1/2 C water, boil 3-5 min and let stew (sit at room temp till cool to touch). Your recipe might be very tasty if you used apple juice instead of water too. Ok that is what I was wondering, I also thought that after you boiled them maybe you should blend the raisins and the resulting "juice/concentrate" thanks for replying.